Public Service Media (PSM) launched its “international channel – Maldives TV” expressing the company’s full commitment to introduce a cost effective way for tourism businesses to maintain promotion continuity to the target markets. 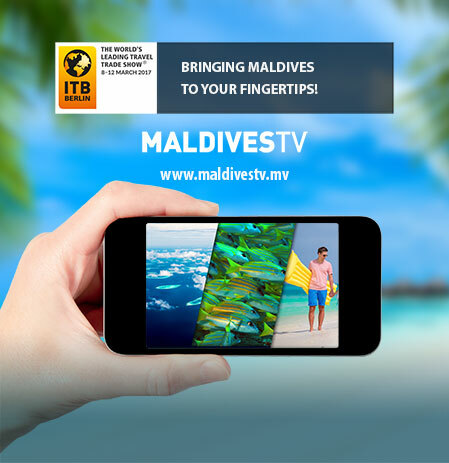 Maldives TV, the first international channel of the Maldives has been officially launched at the ITB fair in Berlin, on 9 March 2017, by the Minister of Tourism of the Republic of Maldives, Mr. Moosa Zameer. The ITB Berlin is the world’s largest tourism fair, which is attended by representatives of travel and tourism businesses, and journalists from all around the globe. The fair which is held annually by ITB Berlin, is a great networking platform where the businesses can engage with other businesses from the industry and promote their products. The international channel, which will broadcast in English, aims to bring the viewers a rich content which would provide valuable information on the history, culture, lifestyle and the travel and tourism industry of the Maldives. PSM believes that the channel would not only promote Maldives as a dream tourist destination, but also assist in the travel planning of potential tourists, by gaining knowledge on the accommodation choices that best suit their budget and requirements. Maldives TV will utilize all available resources in continuously providing up-to-date information to the viewers, via the website, and social media platforms, including Facebook, Twitter and Instagram. Furthermore, an application specifically designed for Maldives TV, will also be made available, to ensure that the content of the channel is reachable at any time and place. Public Service Media is currently operating 4 TV channels, 3 radio channels, a news website and a print magazine, in their effort to incessantly aware, entertain and promote the nation. The newest addition is the international channel, ‘Maldives TV’, which will focus on promoting Maldives as a tourist destination.